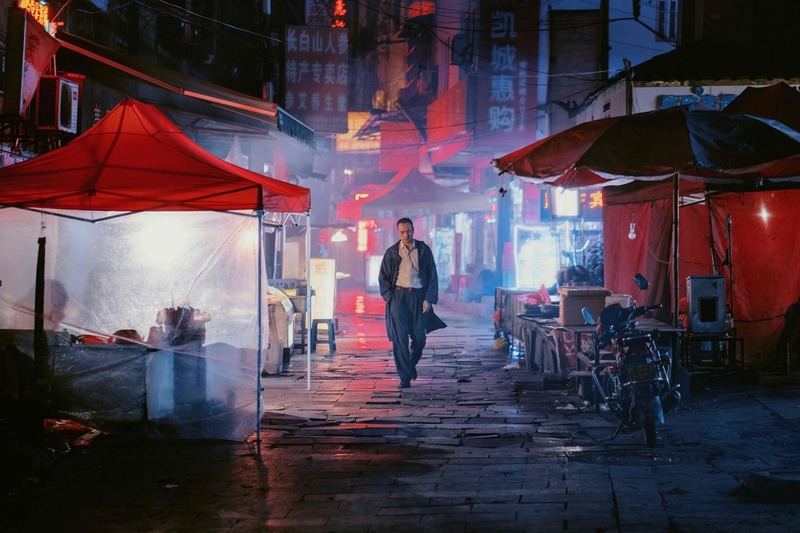 Review: Moody, Mesmeric 'Long Day's Journey Into Night' Writer/director Bi Gan's second feature is a mood piece about a man who returns to his hometown to search for a lost love. The net effect is that of a "stately waltz of movement and illumination." Jue Huang stars in Long Day's Journey Into Night, which features an extended 3D sequence. A haunted loner searches for a mysterious woman. That film-noir staple is the plot of Long Day's Journey Into Night — to the extent that this woozy, mesmerizing reverie has a plot. Chinese writer-director Bi Gan's second feature is primarily an autobiographical mood piece. The movie's protagonist is Luo (Huang Jue), who packs a gun and a tough-guy resume. But he's a poetic sort of hooligan, inclined to muse in voiceover about dreams, memories — and their cousin, the movies. He's looking for beautiful Wan Quiwen (Lust, Caution star Tang Wei), although there are hints that he's also wondering about his long-unseen mother. Bi grew up in Kaili, a subtropical city in southwest China that appears in both his features. He was raised by his father while his mother worked in a distant location. This history is crucial to the director's films, although it's filtered through his cinematic enthusiasms. Journey's humid ambiance may reflect Kaili's climate, but the movie's flooded interiors and dripping sounds also recall Andrei Tarkovsky's Stalker, which Bi has acknowledged as a major influence. Where Kaili Blues's coda is clearly set in the real world, Journey's final sequence is more surreal. Killing time in a bedraggled theater, Luo dons 3D glasses. Next thing he knows, he's in a mine like the one where an old friend was killed. After a ping-pong match, a boy leads him out of the tunnel and to a carnival in a dilapidated industrial site. It's night, and the shadows are deep. Clocks and watches, as in Kaili Blues, don't keep real time. Repeatedly, Luo finds himself cornered or locked in. The camera is freewheeling — and even briefly airborne — but he is not. In a pool hall near the karaoke stage, Luo meets someone who may be Wan Quiwen. "I'm not the woman you think I am," she says. Well, of course. Her identity will remain a enigma. So, too, that of an older woman (Sylvia Chang) who appears briefly. Bi takes a few cues from the detective genre, but he's not intent on solving the case. What matters is what has already happened, even if it can't be precisely recalled, not what transpires in front of the camera. The wisp of a story is really just the occasion for impressionistic musing and evocative picturing. Exquisitely shot by three cinematographers, Journey doesn't attempt to simulate Luo's subjective view of the events. But the film (whose Chinese title is Last Evenings on Earth) does regularly highlight the limitations of human vision. Light is reflected, refracted and diffused. The camera peers through glass — including the wire-reinforced window of a prison visitor's booth — and the murkily transparent vinyl of a night-market partition. Appropriately, when the camera finally stops moving, it comes to rest on a light source. Journey's stately waltz of movement and illumination ends by contemplating a flickering glow.